MORGAN HILL, Calif. -- Ranchers in Northern California shot a wild pig and ended up finding its meat surrounded by Smurf-blue fat. A user on Imgur posted photos and a short explanation of the bizarre discovery at their in-laws' Morgan Hill ranch. The couple cut open the pig, drained most of the blood and were startled to see fluorescent blue fat peeking out of the incision. User GlendilTEK said the ranchers are aware blue pigmentation could be caused by copper poisoning, but there are only old mercury mine shafts near the property. 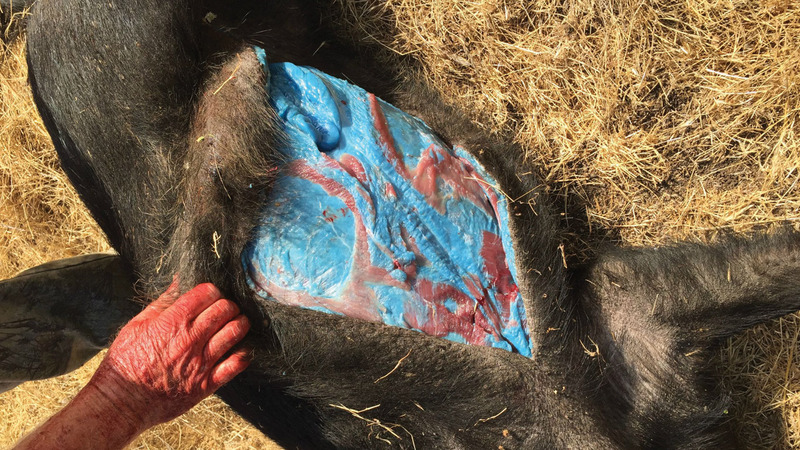 Other wild pigs that were shot by the couple did not have neon blue fat. Samples of the fat were sent off to UC Davis for testing.